Whether purebred dog or crossbreed, both have something in common: Once the cute puppies arrived, they increase in size and weight fast. They grow up quickly and some breeds increase their weight 20-fold within a year. Apart from a loving environment and the right education, they primarily need a healthy nutrition, which is adapted to the special requirements of every growth phase. Adequate puppy food is an essential condition for an optimal development. Physical damages related to a vital substance deficiency can cause high medical costs, sometimes even a whole lifetime. Especially large-size dogs are at risk. The mineral calcium is essential for an optimal development of the skeleton and the teeth. A quick growth can lead to developmental disorders of the skeleton without a sufficient calcium intake through the food. An adult human with a body weight of 65kg need 0,8g calcium daily, whereas a grown dog with a body weight of 30kg needs 1,7g and a puppy with a current body weight of 15kg (final weight 30kg) over 5g calcium daily. 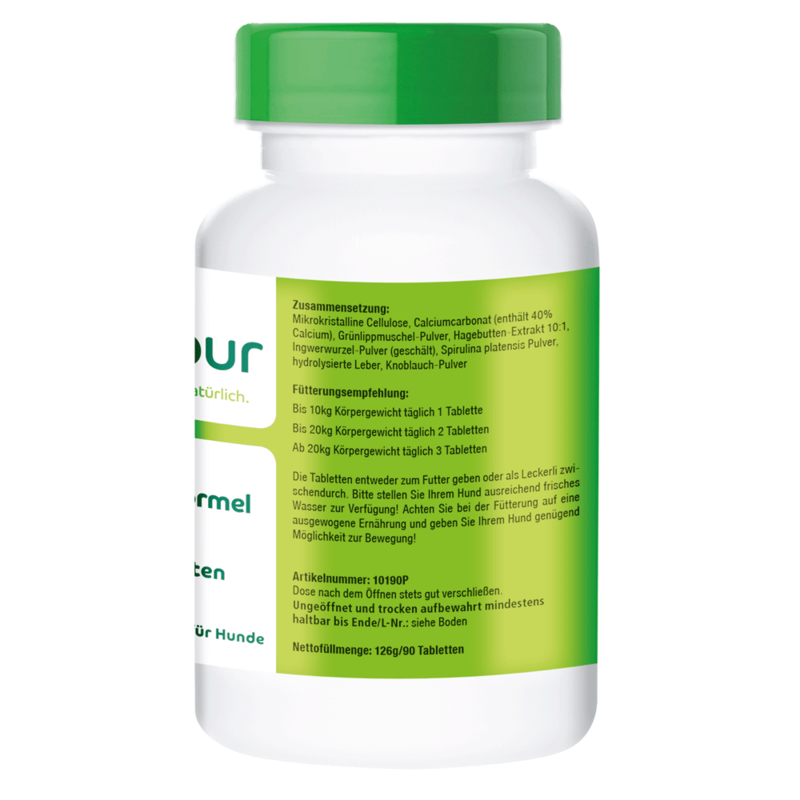 The green-lipped mussel contains high amounts of glycosaminoglycans and is beneficial for the joints and cartilages. 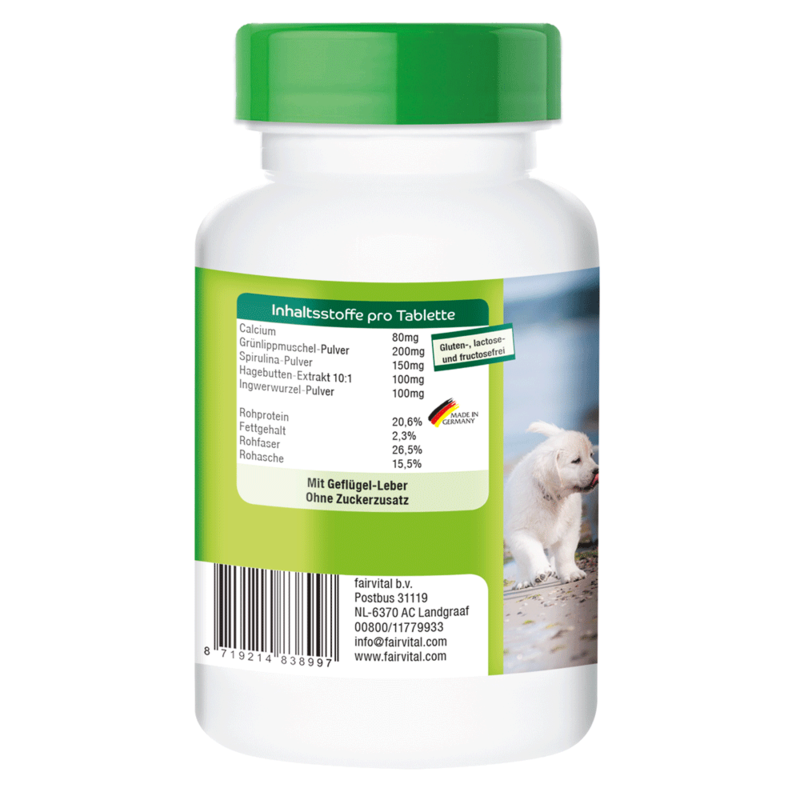 It also contains the cartilage components chondroitin and glucosamine, which protect the cartilage against external pressure. Healthy joints are essential for a long, agile dog life. The alga Spirulina not only contains important amino acids, but also many vitamins, magnesium, potassium, sodium, zinc, iron and gamma-linolenic acid. The microalga activates the immune system. A special feature of spirulina is the ability to promote the formation of new blood cells. Phycocyanin, the blue water-soluble pigment of spirulina is involved in this process. Phycocyanin is able to detoxify the lever and the kidney and is said to be a good antioxidant. Rosehips are a good source of vitamin C. Vitamin C has structuring properties in the development of bones and cartilages and is of importance for the strengthening of the immune system as well as the cell regeneration. Apart from vitamin C, rosehips contain calcium, fibres, linoleic and linolenic acid, fruit acid, pectins, vitamin A and beta-carotene. The ginger root is known to increase the general vitality. It has protective properties for the digestive tract, can counteract worms and can promote the build-up of a healthy intestinal flora. Ginger has antibacterial properties, counteracts vomiting, promotes the circulation and increases the bile production. It is also important to know that ginger is able to reduce travel sickness and nervousness.